In his December 29, 2005, Internet blog, John Thorn, the noted baseball author and SABR member, mentioned that the shotgun that killed Ty Cobb’s father in 1905 had been part of the famous Barry Halper collection of baseball memorabilia—an incredible, if not unbelievable, assertion.1 How could such an artifact of tragedy have survived for 100 years to become part of the most famous collection of baseball memorabilia ever assembled? And more importantly, why? A few months later, the Ty Cobb Museum received a phone call from a representative of the New York Yankees organization, inquiring about the shotgun that was used to kill Ty Cobb’s father.3 The caller, who identified herself only as a member of the Yankees’ marketing department, wanted to know if the museum had any information that could be used to confirm that a shotgun, which the caller said was now held in the collection of an undisclosed Yankee player, was actually the weapon that had been used in the shooting of W. H. Cobb. These two events inspired me to begin a thorough investigation to review all of the information that could be located about the August 8, 1905, shooting of Ty Cobb’s father at the hand of Ty’s mother. I wanted, once and for all, to either confirm or disprove the shotgun element of this tragic event in Ty Cobb’s life story. And, if disproved, I wanted to identify and understand the source of this particularly distasteful part of the myth. An unintended result of this investigation has been to provide new insights into other myths about Georgia’s most famous baseball player—where they began and how they grew. This investigation also demonstrates that new information to be found in the realm of highend baseball memorabilia, often well known among collectors and authenticators but not widely publicized, can be highly relevant to the efforts of baseball researchers and historians. The first step in my investigation was to review the Sotheby’s catalog for the 1999 sale of the Barry Halper Collection, which had netted something over twenty million dollars.4 This unindexed, three-volume set, which provides descriptions, some photos, and the realized prices of the auctioned items, is practically a baseball history in itself and would be an interesting read for any SABR member. My first perusal, however, yielded no information on the Cobb shotgun. 1227 Ty Cobb’s Shotgun . . .
Lifson also replied that the shotgun originally was to be included in the auction and thus had been included in the catalog, but that ultimately it had been rejected because the only provenance was Al Stump’s statement. There was also a question as to whether Sotheby’s was licensed to auction such a firearm.8 The shotgun, as lot 1227, did not appear in the published prices realized list, confirming Robert Lifson’s recollection that it had been pulled from the auction. According to the Sotheby’s catalog, the source of the shotgun in the Halper collection was sportswriter Al Stump, who had collaborated with Ty Cobb on his 1961 autobiography and during that process spent time with Cobb in the last year of his life. I was to later learn that Al Stump was very well known to experts and collectors of high-priced baseball memorabilia. But some obvious questions remained. Why would Ty Cobb, who according to all accounts had been deeply and permanently affected by the untimely death of his beloved father at the hand of his mother, have kept the shotgun supposedly used in the tragedy for the rest of his life? Why would he have used this weapon in many of his later hunting expeditions? Indeed, why would he have had his own name inscribed on the weapon? This conclusion is contradicted by a close reading of the articles, which reveals that the coverage was in fact harsh, even discussing rumors of infidelity and the revelation that W. H. Cobb had a revolver and rock in his coat pocket at the time of his death, which served to heighten the speculation about this sensational case. The court itself was hardly lenient on Amanda Cobb. Not until September 29, 1905, did the court grant her request for bail, requiring a $10,000 bond “with good security,” an extremely large sum in 1905.14 When the trial finally began on March 30, 1906, the court denied a motion for continuance requested by Amanda Cobb on the grounds of the absence of a principal defense witness. Still further, in 1907, after being acquitted, Amanda Cobb had to file suit against the administrator of her late husband’s estate, forcing a division and sale of lands in order for her to receive the “twelve-months support” for her family as provided by Georgia law. A notable result from this exhaustive search of the record is the absence of any mention whatsoever of a shotgun in the press coverage or in the surviving Superior Court records. 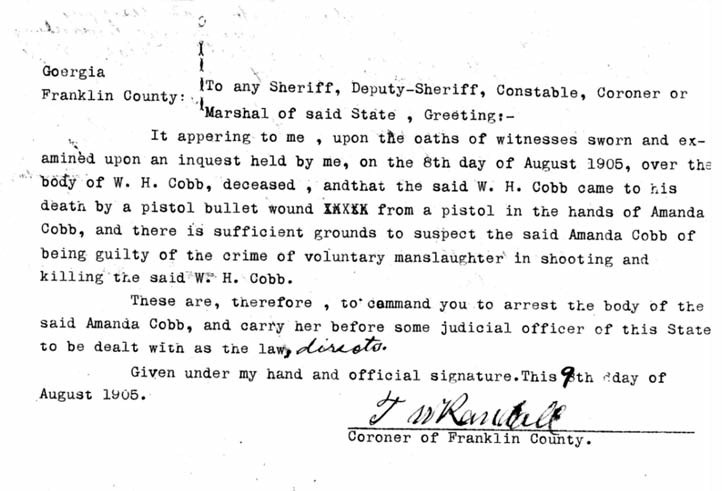 To conclude as a result of this study that a handgun was used in the shooting death of W. H. Cobb, against the widely held belief that a shotgun as used, would hardly be unreasonable. However, as described above, it is doubtful that such a conclusion would be widely accepted, even among the SABR community. Having proven the shotgun story false, my investigation turned to an interesting and obvious question: what is the origin of this sensational and widely believed story that Ty Cobb’s mother killed his father with a shotgun? I completed a thorough review of the biographical literature on Ty Cobb in a search for the answer. Shortly after Ty Cobb’s death in July 1961 and the release of Cobb’s autobiography, Al Stump wrote an article for True Magazine titled “Ty Cobb’s Wild 10-Month Fight to Live.”22 This article is the first recounting of the shotgun story in the literature that was reviewed in this investigation. It will be examined in detail in the following sections. For the next twenty years, all of Cobb’s biographers, including Richard Bak (in both his 199427 and 200528 biographies), Norman Macht (1992),29 S. A. Kramer (1995),30 Patrick Creevy (fictionalized biography, 2002),31 and Dan Holmes (2004),32 relate the shotgun version of the shooting story. Their shotgun stories vary only in the level of detail presented. Don Rhodes, a long-time reporter for the Augusta Chronicle, wrote Ty Cobb: Safe at Home in 2008. Rhodes quotes extensively from the 1905 and 1906 articles that were printed in the Chronicle, taking advantage of the full archives of the Chronicle that were available to him.35 He quotes liberally from the “innuendo filled articles” published by the Chronicle, including one that relates Amanda Cobb’s testimony about using her pistol in the incident. He does not mention the shotgun story. Based on this review of the available biographical literature on Ty Cobb, no account of the shotgun story is found prior to Al Stump’s 1961 True Magazine article. With the exception of John McCallum’s 1975 book and Don Rhodes’ 2008 book, every biography and every article written since 1961 that made mention of the weapon used in the shooting of W. H. Cobb has accepted and retold in one form or another this nowdisproved shotgun story. Ty Cobb’s autobiography was released shortly after his death in July 1961. In December, Al Stump turned to True, The Man’s Magazine to publish his article “Ty Cobb’s Wild 10-Month Fight to Live.” True Magazine was a leader at the time in the men’s adventure genre, which featured lurid covers and provocative titles that oversold allegedly true stories that were usually fictional or mostly so. Besides the “true stories” of war, demented rulers, love-starved Amazons, and so on, magazines in this genre often included pin-up photos, love-life articles, and exposés of vice in cities throughout the world. These often near-pornographic magazines were nevertheless sold openly at newsstands and drug stores—thus the provocative titles and covers to “hook” the macho-male population. The cover of the December 1961 issue showed a full-color photo of four ornate and deadly swords as a lead-in to an article titled “They Live by the Sword.” The cover byline for that issue trumpeted Al Stump’s article with: “Exclusive! The Strange, Wild, Tragic End of Ty Cobb.” Among the other articles in this issue were: “Psychic: The Story of Peter Hurkos,” who was world famous for using ESP to solve baffling crimes; “Daring Dive for Derelict Gold,” about the salvaging of sunken treasure in a deadly minefield of World War II ordinance; and “The Monster Makers,” describing various natural-born and intentionally mutilated human freaks of the middle ages, with grotesquely drawn illustrations. “Men’s adventure” is definitely not the genre from which scholars and historians usually seek truthful, insightful, and unembellished information about anyone or anything. Nevertheless, this is where the Cobb shotgun story began. Unlike his True Magazine article, in the 1994 book Stump identified his source for the details of the shooting of W. H. Cobb as Joe Cunningham, the childhood friend and next-door neighbor of Ty Cobb in Royston. Stump provides several quotations attributed to Cunningham detailing not only the circumstances of the shooting but also Ty’s physical and mental reaction to the tragedy. It is impossible that Al Stump ever had any interaction with Joe Cunningham. Stump never had occasion to be in Royston, with or without Ty Cobb, prior to the 1960 collaboration on Cobb’s autobiography. Joe Cunningham died in 1956.40 The quotations were therefore fabricated to enhance the believability of his story. Possibly, Stump’s information came from interactions with Cunningham’s daughter, Susie, who was still alive in 1960 and who had been interviewed and quoted by biographer Charles Alexander for his 1984 book. Or Stump could have fabricated this dialogue based solely on Alexander’s 1984 biography. The question naturally arises about Joe Cunningham, who, either directly as falsely asserted by Stump or indirectly as asserted by Charles Alexander, was the source of the shotgun story: If he was the first to arrive at the scene of the shooting, why was he not mentioned prominently in the widespread newspaper coverage of the incident and in the subsequent trials? If he was the first to arrive on the scene of the shooting, why was there no challenge to Amanda Cobb’s court testimony that Clifford Ginn, her brother-in-law, was first to arrive? This type of controversy, if it occurred, would have been widely reported in the press, which sensationalized practically every other aspect of the incident. Yet there is no mention of Cunningham in any of the articles or other records that I was able to locate, and thus there is no evidence that Cunningham had even the smallest part in the shooting tragedy or its aftermath. There are no clear answers to these questions for several reasons, first among them being that neither Stump nor Alexander had any direct interaction with Joe Cunningham. In Stump’s case, the story was either fabricated, obtained at second hand from Cunningham’s daughter, or copied and expanded from Alexander’s 1984 biography. In Alexander’s case, as he points out, it came second hand as a family story from Cunningham’s daughter, and is highly suspect for this reason alone. A recent interview with noted Atlanta sportswriter and editor Furman Bisher clouds the veracity of the Cunningham story even further.41 Bisher knew Ty Cobb well, having written a widely read 1953 article which addressed the death of W. H. Cobb and an in-depth Saturday Evening Post article about Cobb’s return to Georgia in 1958. Furman stated in this recent interview that he also knew Joe Cunningham well and had spoken to him on several occasions. Furman Bisher stated that Joe Cunningham had told him directly in the early 1950s that Amanda Cobb was not the one who shot W. H. Cobb but that the shots had been fired by her paramour when they were caught together by Professor Cobb after he returned home unexpectedly. However, Susie Cunningham Bond, Joe Cunningham’s daughter and Alexander’s source, told writer Leigh Montville in 1982 that “her father did not think another man shot Ty’s father, that Amanda Chitwood Cobb did, indeed, pull the trigger, and that Amanda knew who her target was.”42 These conflicting stories from Cunningham and his family about what Cunningham did and did not believe cast serious doubt on the truth of anything sourced to Joe Cunningham or his family. More likely, Joe Cunningham, who lived his entire life in the small town of Royston and became the town undertaker, found an outlet in his old age for foggy or perhaps fantasized recollections about the town’s most famous citizen and recounted differing versions of the story to family and to visiting sportswriters and historians. Prior to beginning his collaboration with Ty Cobb in 1960, Stump had written many sports-related articles on the lives and careers of other notables, including Mel Ott, Bob Lemon, Gil McDougald, Ralph Kiner, Eddie Mathews, Duke Snider, Jackie Jensen and Jack Harshman.44 These articles appeared in Sport Magazine, American Legion Magazine, The Saturday Evening Post, Argosy, and Saga (as well as in True Magazine), and many were anthologized in a 1952 book, Champions Against Odds.45 No doubt Cobb, an avid reader, was familiar with these articles and was impressed enough to hire Stump to work on his autobiography. Stump’s second wife, Jolene Mosher, also a writer, said in describing Stump’s writing method that he “liked to sit back, have a few drinks, and egg someone on. . . . He’d encourage them to act up, to be really bad. He’d get good stories like that.” She also disclosed about Stump: “His only hobby was drinking.”49 No doubt this tactic, and possibly this hobby, was at play as Stump interacted with Cobb in their 1960 collaboration, producing fodder for the sensational and fictionalized parts of the True Magazine story. Al Stump’s literary hero was Ernest Hemingway, a role model for many young postwar writers who imitated his writing style, even if they were unable to live his adventurous lifestyle.50 Hemingway died in 1961 at his own hand from a shotgun blast to the head—only two weeks before Ty Cobb died. This tragic but sensational event was widely reported around the world, and the resulting months-long flurry of articles was surely followed closely by an admiring Al Stump. Afterward, Hemingway’s wife told Idaho authorities that the shotgun had discharged accidentally while Hemingway was cleaning it.51 His estate later sought to prevent the publication of details of the gruesome death scene,52 and a family friend took the shotgun that Hemingway had used, disassembled it into a dozen different pieces, and buried the pieces in widely different locations to prevent memorabilia collectors from later profiting from the gruesome relic.53 There is no evidence on which to conclude that the widely publicized shotgun death of Hemingway, Stump’s idol, influenced him as he crafted the fictionalized shotgun account of the death of W. H. Cobb. But the similarities to the W. H. Cobb shotgun story created by Stump are striking, particularly the gruesome descriptions of the death scenes. These similarities, and the coincidence of the shotgun death of Hemingway at precisely the same time as Stump’s 1961 writing efforts, make for interesting speculation about a possible influence. Despite the substantial volume of work that Stump produced in his otherwise mediocre 50-year career, he received no national publicity or recognition, and certainly no acclaim, for anything unrelated to Ty Cobb. His only real career success—and his only lasting legacy—was based exclusively on Ty Cobb. Having saved all his notes and papers from the 1960 collaboration to produce his magnum opus in the 1994 Cobb biography and movie, Stump never escaped from the shadow of Ty Cobb hovering over him as the defining subject in his life’s work—but, perhaps he never really tried.54 In the intervening years, he either saved or created a large amount of additional material relating to Ty Cobb to sustain a newly found and profitable fascination with baseball memorabilia. At the time of Ty Cobb’s death, Stump came into possession of a very large number of Cobb’s personal effects. Stump claimed that Ty Cobb had given him many personal possessions that had been in his Atherton home when he died and ultimately offered a note from Ty Cobb as evidence of the gift (see exhibit 3). Almost two decades later, Stump began a concerted effort to sell a substantial part of his “collection,” and thus began an interesting but little-known story that illuminates another method that Al Stump chose— beyond gory shotgun stories and sports fantasy writing—to ride Ty Cobb’s coattails to personal fame and fortune. Cobb’s leather-bound hip-pocket whisky flask, his silver-plated shaving mug and brush, straight-edge razor from the thirties, silver pocket knife, German-made, Damascus barreled shotgun used by Cobb in bird-hunting, a snakeskin-wrapped cane he used in 1960 (real oddity), razor strop, tobacco humidor, wrist watch, pen-and-pencil set and set of decoy ducks. All of these items are prominently engraved or otherwise inscribed with Cobb’s name or initials. 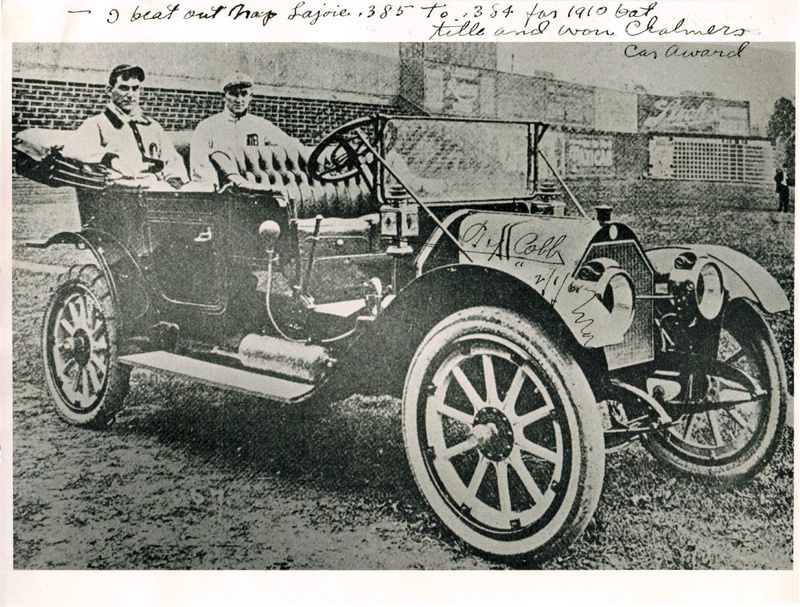 I also have numerous photos, autographed, of Cobb, with Babe Ruth, in action poses, at the wheel of his racing cars, posed formally at home, even his baby picture, etc. his gun having been the one used by Amanda Cobb in the shooting of W. H. Cobb—that only became part of the story when the shotgun was sold into the Halper collection and ultimately described in the 1999 Sotheby’s catalog for the Halper auction. 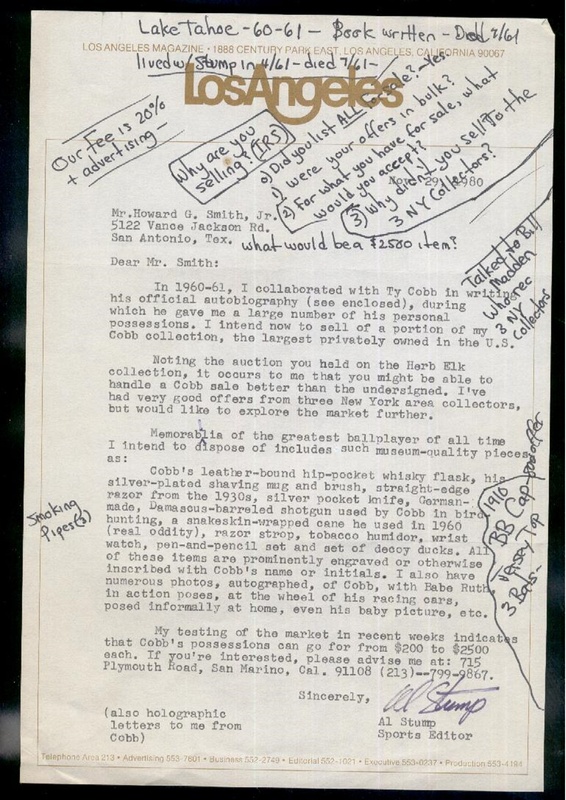 Apparently, no agreement was reached between Stump and Smith as a result of this exchange of letters, because the items they discussed all found their way into other auctions and collections, many ultimately landing in Barry Halper’s. Even today, when an item from Stump’s collection appears at auction, there most often is also a photocopy of the note, handwritten by Cobb, which tells Stump: “You can have all the ties, shirts, robes, etc. 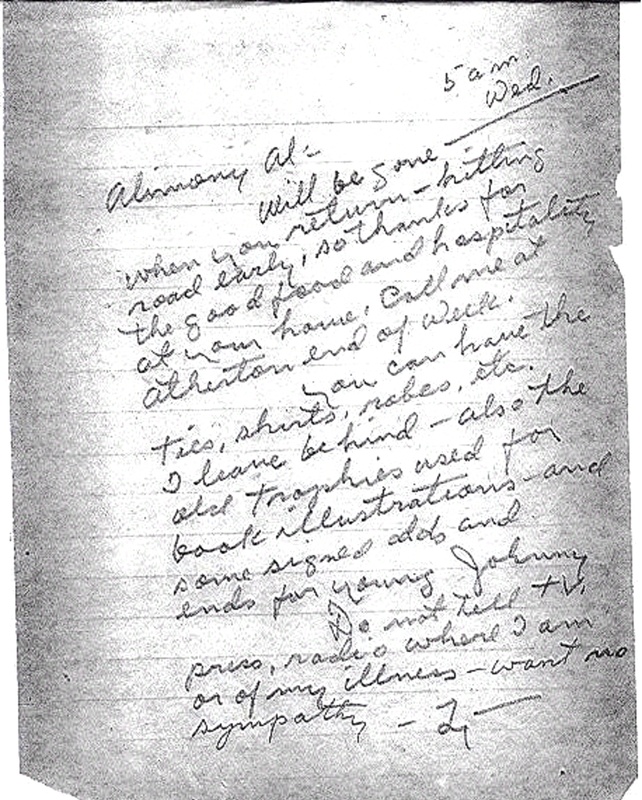 I leave behind—also the old trophies used for book illustrations—and some signed odds and ends for young Johnny.” This note is the supposed permission that Stump had for having taken the very extensive number of personal items from Cobb’s Atherton residence. Stump’s December 16, 1980, letter offered a copy of this letter to Howard Smith, describing it as: “A copy of a letter Ty to me— in which he tells me to help myself to a bunch of his things stored at Atherton.” But the letter actually gives Stump only a few items that Cobb left at Stump’s Santa Barbara residence when he departed after a working session there on the 1961 autobiography. It is clear that the limited scope of what Ty Cobb actually gave to Al Stump was far exceeded by the essential cleanout from Cobb’s Atherton home of every conceivable item that could in any way be associated with Cobb—even his false teeth (see exhibit 6). Item 13 of the December 16, 1980, list sent to Howard Smith by Al Stump is described as: “Letters to me from Cobb, typed for him on his personal letterhead stationary and signed ‘Ty,’ in which he discusses what he wanted to go into his autobiography and other matters: 6 x 7 inches.” These letters, estimated by experts in the autograph business to be as many as 50 to 100 in number, created much excitement in the collecting community when they surfaced, principally because of their extensive baseball content—a fact that adds considerable value to any famous player’s correspondence. On cursory inspection, they appear authentic, since they are typed on apparently genuine Ty Cobb letterhead and signed in the green ink that Ty Cobb was well known for using. Ultimately these letters were sold into the market and then were discredited as forgeries by numerous authenticators. They were first offered to Mike Gutierrez, a prominent authenticator, who authenticated them as genuine and then sold them directly and at auction to trusting buyers. Although the signatures on these letters displayed a more shaky hand than authentic Cobb signatures, Gutierrez explained that to be a result of Cobb’s advancing age and declining health and strength—something modern authenticators have disproved through a thorough analysis of steady Cobb signatures dated as late as May 1961, only two months before his death. The fantastic baseball content contained in these forged letters has been quoted by unsuspecting historians, and the incorrect and falsified information has become part of accepted history.58 One example of these Ty Cobb letters forged by Al Stump is in exhibit 7. Exhibit 6. Above, a partial listing of the Ty Cobb memorabilia items from the Al Stump collection offered or sold at various times between 1980 and 2001. Comparison of this list to the six specific items gifted to Stump by Ty Cobb in the note of exhibit 3 raises the question of the legitimacy of Stump’s possession of these Ty Cobb collectibles. Josh Evans, a widely respected memorabilia expert and principal in the very successful Leland’s Auctions, has a much more serious indictment of Al Stump. Evans, a young collector and authenticator in the mid-1980s when Al Stump was actively trying to sell Cobb memorabilia, worked with Mike Guttierez on selling the Cobb items that Stump supplied. Many of the items were sold to Barry Halper, one of Evans’ best customers. 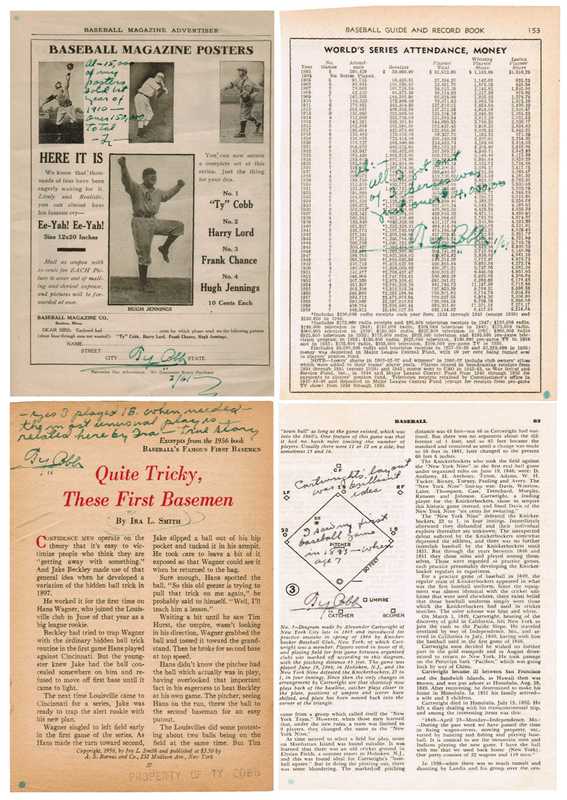 After seeing multiple batches of purported Cobb items arrive from Stump via Guttierez, and becoming ever more suspicious with each batch, Evans notified Guttierez that, in his judgment, the items were all fakes—not just the now-infamous Stump letters on Cobb stationary, but many other personal items that had supposedly been owned by Ty Cobb. In a recent interview, Evans stated: “The Cobb stuff that was coming to me through Gutierrez all looked like it had been made yesterday. It seemed that Stump was buying this old stuff from flea markets, and then adding engravings and other personalizations to give the appearance of authenticity.” Young Evans was so distressed by the fake Stump material that Gutierrez continued to sell that he first told Barry Halper of his suspicions and then contacted the FBI in an attempt to get an official investigation of Al Stump started. 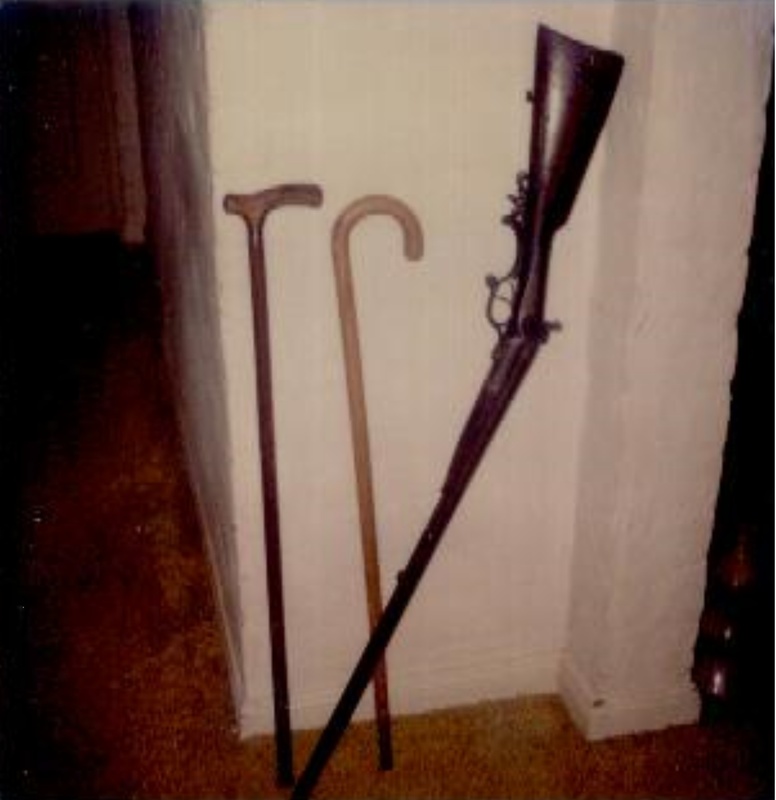 The most recent and perhaps most embarrassing episode in the Stump forged memorabilia saga first came to light, as did the fake Cobb shotgun, via the Barry Halper collection. 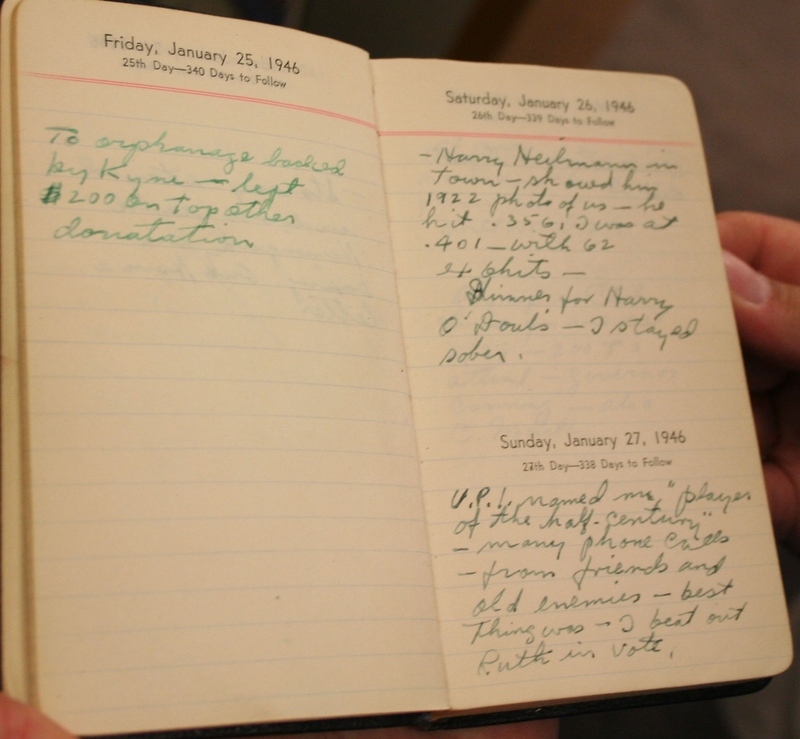 Among the 180 Halper items purchased in 1998 by MLB and donated to the Hall of Fame Museum was a 1946 diary of Ty Cobb’s (see exhibit 10). This diary was an important addition to the Cooperstown collection, which was accompanied by other truly significant relics such as Shoeless Joe Jackson’s 1919 White Sox jersey and the contract that sent Babe Ruth from the Red Sox to the Yankees. The Cobb diary was a prized acquisition, covering the entire month of January 1946 and containing daily handwritten entries in Cobb’s famous green ink. The museum made a realistic looking copy of the diary to assure that the valuable original would not be damaged while displayed from 1999 through 2001 in the “Halper Memories of a Lifetime” exhibit in the Barry Halper Gallery. Visitors to this exhibit could view the original Cobb diary, wall-mounted in a clear protective case, and then peruse this realistic-looking copy, turning page by page with their own fingers, reading and relishing each daily entry of very personal notes and comments that Cobb had made to himself. The entries were tantalizing to museum visitors and to writers and historians as well, providing new insights into this complicated icon of the game. The diary, never before seen by the public, included musings Cobb made to himself like “drinking too much” and “I stayed sober” and many other secret tidbits that Cobb wrote as comments or criticisms about other players. These entries had obviously been written with no inkling that they would ever be seen by the any but Cobb’s own eyes. Or, so it appeared. Evidently, Ernie Harwell was not aware of a 1995 Sports Illustrated article by Franz Lidz titled “The Sultan of Swap,” which provided an in-depth look at Barry Halper and his extensive memorabilia collection.70 Along with details about many of Halper’s relics, this article describes in text and photographs many of the items of “Cobbabilia” that Halper had collected. Lidz had access to the entire Halper collection, and had grouped many Cobb items to be photographed for his article, including a game-worn Detroit jersey, Cobb’s dentures and the infamous Cobb shotgun. Lidz wrote: “Halper has the Georgia Peach’s straightedge razor, shaving cup, shaving strop, bathrobe, diaries, dentures, fishing hat, corncob pipe, pocket flask and even the shotgun Cobb’s mother used to blow away his father. Halper wheedled all this out of Al Stump” (emphasis added). Furman Bisher, sports editor and writer for the Atlanta Constitution for 59 years, knew Ty Cobb well. He wrote several articles on Cobb and spent three full days with him in 1958 when he was writing the Post article about Ty moving back to Georgia and building his final retirement home. Furman knew Al Stump from his writings and as a result has a very low opinion of him. In my recent interview with Furman, he stated strongly that “the True Magazine article was a disgrace” and that “Al Stump took advantage of a dying man.” When asked about the provocative stories that Stump wrote about Cobb, he went further: I would not believe a thing he said.” Furman Bisher felt so strongly about the injustice done to Ty Cobb by Al Stump that he took more than an hour away from the time he had devoted to writing the last column of his 59-year career with the Constitution to be interviewed on Cobb and Stump. Historian Charles Alexander, in his more recent writings, took direct aim at Stump’s credibility, asserting that Stump had not actually spent the amount of time with Cobb that he had claimed, describing the Stump interaction with Cobb instead as a “14-month intermittent collaboration.”73 Alexander also charged that much of Stump’s writings on Cobb had borrowed heavily, and without attribution, from the 1975 John McCallum biography. Alexander later said that the 1961 True Magazine article “read like a gothic horror story.” Alexander also wrote recently that he had been the first author to “pin down the particular circumstances of William Herschel Cobb’s death from gunshots fired by his wife, Amanda Chitwood Cobb, and her trial and acquittal the following spring.”74 Charles Alexander did indeed “pin down” details on the shooting of W. H. Cobb, but unfortunately his source of information was both second hand and faulty. He was incorrect in the retelling of the now disproved shotgun story and, as a result, was incorrect in writing his own somewhat gory description of the crime scene. This investigation dispels perhaps the most distasteful element of the Ty Cobb myth with definitive proof. 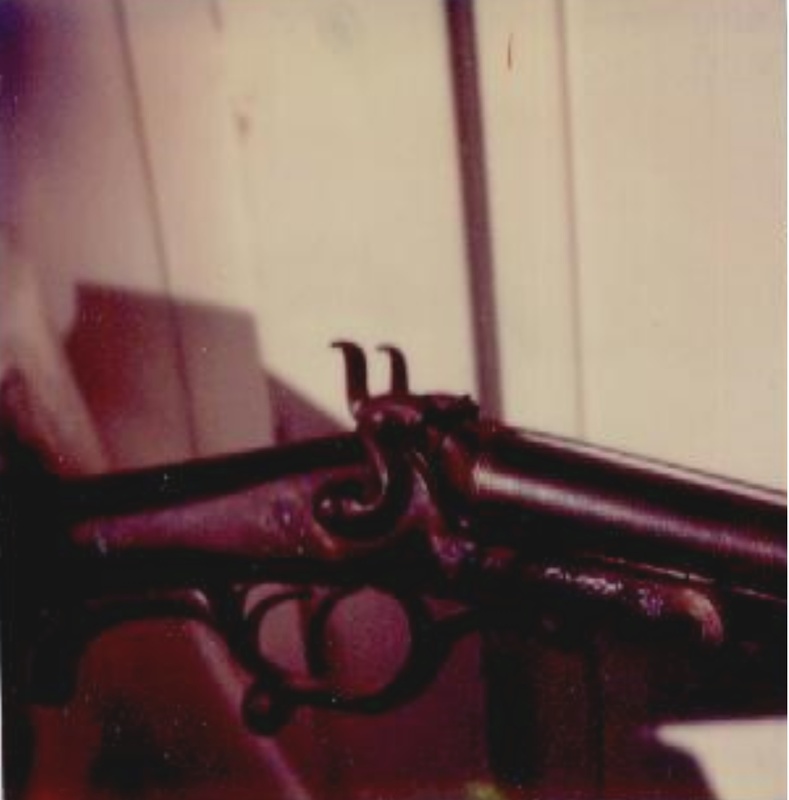 A pistol, not a shotgun, was used in the shooting of W. H. Cobb, and therefore there was no crime scene in which W. H. Cobb’s head was practically blown off at the neck, nor did his abdomen pour forth its contents onto the porch roof of the Cobb home in Royston. Two pistol shots were all that were fired, and even at close range, these could not produce the grotesque scene that myth would have us believe. Another of the more outrageous stories written by Stump was the “Cobb killed a man” story, which also first appeared in Stump’s 1961 True Magazine article and then was enhanced in his 1994 Cobb biography. In Detroit, on August 12, 1912, Ty Cobb and his wife were attacked by three robbers, whom Cobb managed to fight off, sustaining only a knife wound to his back. Ty then traveled by train to Syracuse and played in a game the following day. This attack was reported widely in the press in the days following the incident. 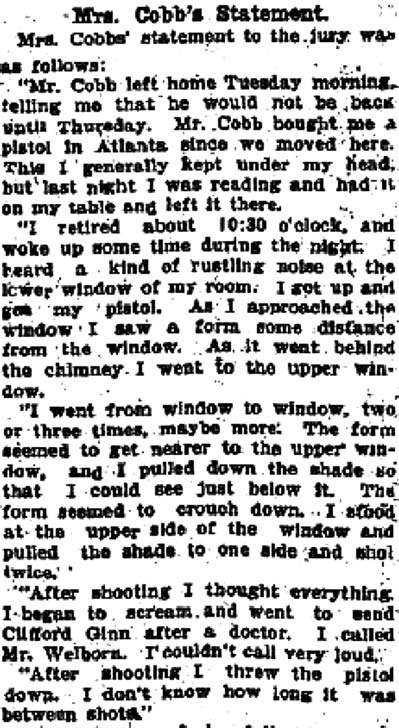 Al Stump, who misdates the attack to June 3, 1912, has Ty confessing to having killed one of his three attackers. After Ty’s pistol wouldn’t fire, he supposedly told Stump that he had killed one attacker by using the gunsight of his pistol to “rip and slash and tear him . . . until he had no face left.” To the 1994 Cobb biography Stump adds this substantiation of the story: “A few days later a press report told of an unidentified body found off Trumbull in an alley.” That a death occurred in this incident was conclusively disproved in the 1996 National Pastime article “Ty Cobb Did Not Commit Murder.”75 SABR member Doug Roberts, a criminal lawyer, former prosecutor, and forensics specialist, performed an exhaustive study of the Detroit autopsy records for the time period around the 1912 attack and found not a single piece of evidence that a death such as Stump described had actually occurred. Further, Roberts found no Detroit newspaper article describing such a death or the discovery of an unidentified body, as Stump had asserted. Doug Roberts concluded that no murder occurred at the hands of Ty Cobb. So what other outrageous Stump stories about Cobb are either completely false or overblown and exaggerated? That Cobb’s close friendship with Ted Williams ended completely after an argument over which players should be on the all-time All-Star team—refuted by Williams himself, who said Stump invented the story and bluntly generalized about Stump: “He’s full of it.”81 That Cobb refused to sign autographs for fans and was unfriendly to kids— refuted by Jean Eilers affidavit described above and further disproved by the hundreds of genuine Cobbsigned baseballs, postcards, photos, and other items, many personalized to children, which survive and now sell for thousands of dollars each in the memorabilia market. That he carried a loaded Luger with him to his last hospital stay in the same brown bag that contained a stack of negotiable securities—refuted by Jimmy Lanier, Cobb’s personal batboy in 1925 and 1926, who with his son, Jim, visited Cobb in his last days at Emory Hospital, listened as Cobb showed and described the Coca-Cola stock and other securities in the brown bag, and saw no evidence of a gun, either in the bag or elsewhere in the room.82 That Ty Cobb’s funeral was shunned by all but a few baseball players and dignitaries—refuted by The Sporting News, which reported shortly after Ty’s death that the family had notified Cobb’s friends and baseball dignitaries that the funeral service, held only 48 hours after Cobb passed, was going to be private and asked them not to attend.83 A more appropriate question would surely be: What Stump stories about Ty Cobb are not either outright fantasy or gross exaggerations based loosely on questionable fact? Ron Shelton, who directed the movie Cobb based on Al Stump’s writings, called Stump a “supreme storyteller” in the eulogy he delivered at the memorial service after Stump’s death.84 It is a longstanding Southern tradition to call someone a “storyteller” as a polite way of calling him a liar. Although Shelton surely missed this regional nuance, it nevertheless seems an appropriate moniker for Al Stump. There is no doubt that Al Stump is a proven liar, proven forger, likely thief, and certainly a provocateur who created fabricated and sensationalized stories of the True Magazine ilk. Can there be any doubt that scholars and historians should adopt the same approach to Al Stump–written material that the memorabilia experts have adopted toward Stump’s forged memorabilia: dismissing out of hand as untrue any Ty Cobb story that is sourced to Al Stump? Ty Cobb created more than the normal amount of controversy during his lifetime, and he lived to suffer the negative effects of his actions on his reputation. Until his death in 1961, Ty was genuinely concerned with his baseball legacy, often expressing concern about being remembered for spikings, fighting, and aggressive play. 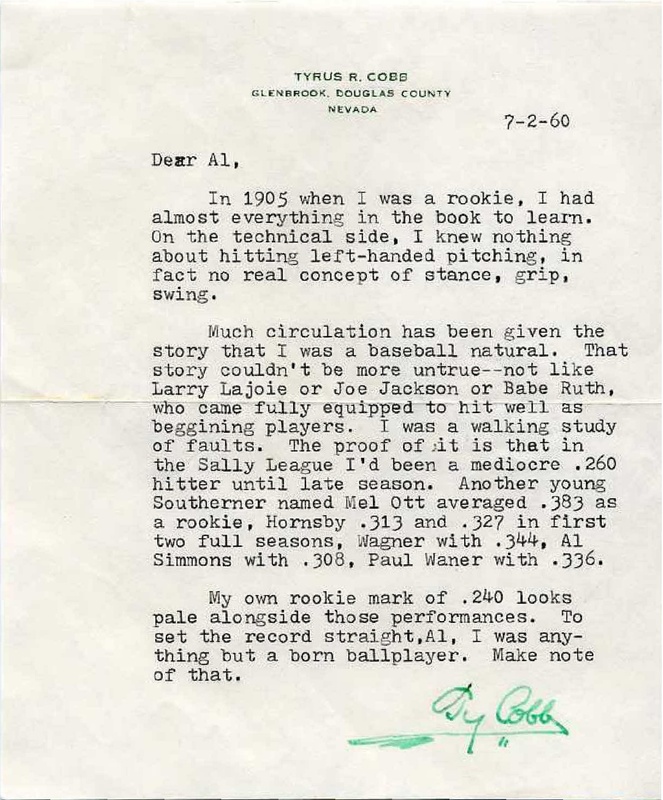 Even more controversy, beyond that related to Cobb’s playing style, has arisen since his death, practically all of it deriving from the sensationalized and fictional writings of Al Stump. These are the writings that are responsible for many, if not most, of the more outrageous—and mostly untrue—elements of the Cobb myth. I urge each SABR member, and indeed any baseball fan or historian who seeks to know and support the unexaggerated truth, to reexamine his own beliefs about Ty Cobb in light of the results of this investigation. For the others whose inquiring minds insist on believing untruths and exaggerations or who thrive on the excitement and provocation of the True Magazine style of history, there will likely never be a proof or revelation that will dispel their beliefs. Sadly, many widely read contemporary sports bloggers, writers, and commentators fall into this latter category, much to the continuing detriment of Ty Cobb’s memory. WILLIAM R. “RON” COBB is editor of "My Twenty Years in Baseball" (Dover, 2009) by Ty Cobb and initiated reprints of several historically significant baseball books. He serves on the board of advisors of the Ty Cobb Museum in Royston, Georgia. 1. Thorn, John, blog post dated 29 December 2005. http://thornpricks.blogspot.com. 2. Personal communication, Wesley Fricks, historian for the Ty Cobb Museum, e-mail dated 16 July 2006. 3. Personal communication, Candy Ross, curator of the Ty Cobb Museum, October 2006. 4. The Barry Halper Collection of Baseball Memorabilia, Sale 7354, 3 vols. (New York: Sotheby’s, 1999). 5. Personal communication, Tim Wiles, director of research, Cooperstown HOF Museum, e-mail dated 9 August 2006. 6. Personal communication, Robert Lifson, e-mail dated 26 November 2006. 7. The Barry Halper Collection of Baseball Memorabilia, Sale 7354, vol. 1: The Early Years, 429. 9. “Cobb Was Told to Keep Watch Over His Home,” Atlanta Journal, 11 August 1905, 1. 10. Personal communication, Joanne Smaley, Georgia Archives researcher, e-mail dated 30 June 2009. 11. Macon (Ga.) Weekly Telegraph, 25 September 1905, 1. 13. Messages posted to the SABR Deadball Committee Yahoo Group site, 22–23 June 2004. http://groups.yahoo.com/group/deadball. 14. Franklin County, Ga., Superior Court minutes, Book 5, 1901–1905, p. 478, GAR.RG-159-1-58. 15. Personal communication, Wesley Fricks, historian for the Ty Cobb Museum, e-mail dated 17 July 2009. 16. Sverre Braathen, Ty Cobb: The Idol of Baseball Fandom (New York: Avondale Press, 1928). 17. Ty Cobb, My Twenty Years in Baseball (Mineola, N.Y.: Dover, 2009). 18. H. G. Salsinger, “Which Was Greatest: Ty Cobb or Babe Ruth?” Baseball Register column, The Sporting News (1951). 19. Gene Schoor, The Story of Ty Cobb (New York: Julian Messner, 1966). 20. John McCallum, The Tiger Wore Spikes: An Informal Biography of Ty Cobb (New York: A. S. Barnes, 1956). 21. Ty Cobb, My Life in Baseball: The True Record (New York: Doubleday, 1961). 22. Al Stump, “Ty Cobb’s Wild 10-Month Fight to Live,” True—The Man’s Magazine, December 1961, 38. 23. John McCallum, Ty Cobb (New York: Henry Holt, 1975). 24. Robert Rubin, Ty Cobb: The Greatest (New York: G. P. Putnam, 1978). 25. Charles Alexander, Ty Cobb (New York: Oxford University Press, 1984). 26. Don Rhodes, Ty Cobb: Safe at Home (Guilford, Conn., Lyons Press, 2008), 24. 27. Richard Bak, Ty Cobb: His Tumultuous Life and Times (Dallas: Taylor, 1994). 28. Richard Bak, Peach: Ty Cobb in His Time and Ours (Ann Arbor, Mich.: Ann Arbor Media, 2005). 29. Norman Macht, Ty Cobb (New York: Chelsea House, 1993). 30. Sydelle Kramer, Ty Cobb: Bad Boy of Baseball (New York: Random House, 1995). 31. Patrick Creevy, Tyrus (New York: Forge, 2002). A fictionalized biography of Ty Cobb. 32. Dan Holmes, Ty Cobb (Westport, Conn.: Greenwood Press, 2004). 33. Al Stump, Cobb: The Life and Times of the Meanest Man Who Ever Played Baseball (Chapel Hill, N.C.: Algonquin Books, 1994). 34. Tom Stanton, Ty and the Babe (New York: Thomas Dunne Books, 2007). 37. Al Stump, “The Last Days of Ty Cobb,” Baseball Magazine 95, no. 1 (January 1965): 14–18. 38. Charles Einstein, ed., The Third Fireside Book of Baseball (New York: Simon & Schuster, 1968). 40. Personal communication, Candy Ross, curator of the Ty Cobb Museum, e-mail dated 21 October 2009. 41. Personal communication, Furman Bisher, sports editor for the Atlanta Constitution, interview on 9 October 2009. 42. Leigh Montville, “The Last Remains of a Legend,” Sports Illustrated 77, no. 17 (October 1992): 60. 44. The Baseball Index, Society for American Baseball Research. www.baseballindex.org. 45. Al Stump, Champions Against Odds (Philadelphia: Macrea Smith, 1952). 47. Al Stump, The Champion Breed: The True, Behind-the-Scene Struggles of Sport’s Greatest Heroes (New York: Bantam Books, 1969). 48. Milo Speriglio, The Marilyn Conspiracy (New York: Pocket Books, 1986), 26–31. 51. New York Times, 3 July 1961, 1. 52. Ron Martinetti, Hemingway: A Look Back. www.americanlegends.com/authors/index.html. 53. Private communication, e-mail from Ron Stinson, 5 August 2008. 54. Private communication, interview with Lewis Martin, Al Stump’s 1994 researcher in Michigan, 12 November 2009. 55. Personal communication, Al Stump to Howard G. Smith, letter dated 29 November 1980. This letter and several follow-up letters, along with memorabilia item lists and photographs, are in the personal collection of the author. 56. Personal communication, Al Stump to Howard G. Smith, letter dated 16 December 1980. Original in the author’s personal collection. 57. Personal communication, Al Stump to Howard G. Smith, letter dated 15 January 1981. Original in the author’s private collection. 58. Jim Stinson, “Ty, Pariah or Peach,” Sports Collectors Digest (5 May 2006): 36–42. 60. Ronald B. Keurajian, “Ty Cobb Autographs.” www.autograph-club.org/autograph-article/ty-cobb-autographs.html. 61. Personal communication, Harvey Swanebeck, SABR member and collector, interview on 4 November 2009. 63. Personal communication, Karl Stone, e-mail dated 5 June 2009. 64. Personal communication, Ron Kerurajian, interview on 20 November 2009. 65. Personal communication, Ron Kerurajian, e-mail dated 18 October 2009. 66. Personal communication, Robert Lifson, interview on 9 October 2009. 67. Personal communication, Josh Evans, interview on 11 November 2009. 68. Ernie Harwell, “Questions Remain about the Fake Cobb Diary,” Detroit Free Press, 5 July 2009, www.freep.com. 70. Franz Lidz, “The Sultan of Swap,” Sports Illustrated, 22 May 1995, 66-77. 71. Personal communication, Ron Keurajian, e-mail dated 20 May 2010. 72. Personal communication, Janel Hendrix, curator of The Elliot Museum, e-mail dated 10 April 2010. 73. Charles C. Alexander, “Introduction,” in My Life in Baseball: The True Record (Lincoln: University of Nebraska Press, 1993), xi. 74. Charles Alexander, Ty Cobb (Dallas: Southern Methodist University Press, 2006), 263. 75. Doug Roberts, “Ty Cobb Did Not Commit Murder,” The National Pastime 16: 25–28. 77. Montville, “The Last Remains of a Legend,” Sports Illustrated, 1982. 80. Jean Bergdale Eilers, affidavit signed in 2008, held in the private collection of Ronald B. Keurajian. 82. Personal communication, Jim Lanier Jr., interview on 29 October 2009. 84. Geoff Boucher, “This Raconteur Was Simply the Best of the Best,” Los Angeles Times, 26 January 1996. http://articles.latimes.com/1996-01-26/news/ls-28983_1_al-stump.